Both Holly and Lara absolutely love spotting books right now. In fact, I'd go so far as to say, spotting is their favourite past-time! Spot A Lot, Vehicle Adventuree by Steve Smallman and Nicola Slater is the latest addition to our spotting collection and instantly inspired both girls to get spotting. I KNEW Lara and Holly would enjoy Spot a Lot, Vehicle Adventure because they both very much enjoy the prequel, Spot a Lot, Animal Escape. This picture book features a parcel that is struggling to make it to its destination because the delivery vehicle broke down... follow the parcel on its journey using lots of different types of vehicles. On each page, not only do you have to spot the parcel but there is also a little dog on every page as well as lots of puzzle prompts to help you search for other vehicles and creatures too. Both Holly (3) and Lara (nearly 6) enjoy the challenge of spotting and counting all of the things they have been asked to. When I'm reading with them, I set them other challenges beyond the words in the book because the illustrations are packed full of different cars, buses, diggers, boats, people, buildings and animals to search for. Each page features a number which increases as you move through the book - this is good learning practice for Holly to remind her what comes next. We love the Spot a Lot books and we all notice something new on every page each time we pick up this book. 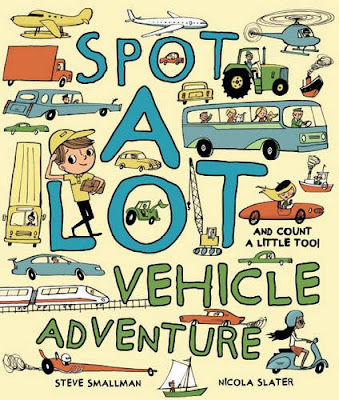 Its a great book for children from 3-10 years who like spotting, or who like vehicles of all sorts. Find out more through the paragon books social channels on twitter and facebook.